I’m an unabashed fan of tall buildings, high-rises, skyscrapers- whatever you want to call them. Not only do they lend cities a sense of identity by the way a collection of tall buildings can uniquely define a skyline, they also offer occupants a chance to experience urban environments in the elusive z-axis. Residential towers offer the potential to transform neighborhoods into bustling high-density zones of activity. There is arguably no other type of building that defines the current modern era of world architecture better than the skyscraper. The high-rise building type is not without its calculated risk though, especially when it comes to the issue of safe occupant egress in case of emergency. 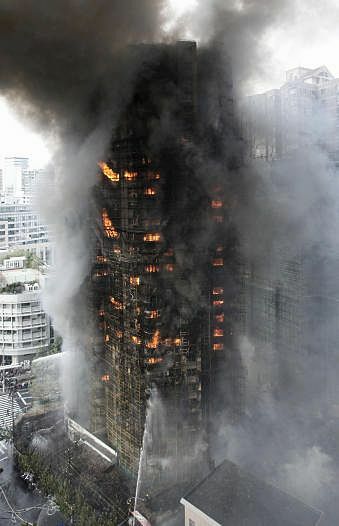 When tall buildings do fail (a very rare occurrence), the results are sometimes disastrous. One only needs to remember the image of the collapsing World Trade Center Towers in Manhattan to get a grim reminder of the great risk and loss of life skyscrapers can pose. Rest assured, professionals involved in the design and construction of tall buildings strive to make these structures as safe as possible. Architects, structural and mechanical engineers, fire safety consultants, fire safety system-manufacturers, vertical transportation specialists, and construction contractors collaborate together to ensure that high-profile skyscraper projects conform to the highest safety standard. Unfortunately the world got another reminder of the potential danger of tall buildings this past Monday when a 28-story residential high-rise caught fire in Shanghai, resulting in the deaths of 53 people and injuring more than 70. In this particular case, it is suspected that the fire originated by sparks from welding work taking place on the exterior of the building as part of a renovation effort. It is likely that the fire spread quickly due to the bamboo scaffolding surrounding the building. Other facts have yet to be determined, such as if the renovation work being done was following proper safety procedures, and if fire safety systems in the building were up to par. Questions also abound about the rescue effort; was everything possible done to rescue residents trapped inside the building? These questions are sure to answered in the coming days and weeks ahead as investigation proceeds. If it was in fact a fire started by welding sparks, then we will know that this unfortunate tragedy was caused by factors external to the building, and not within the building itself. Given this scenario, it calls into question the safety procedures specifically regarding renovation work, especially on occupied buildings. It is not at all uncommon to see bamboo scaffolding around occupied buildings under renovation in Chinese cities. Due to various factors, it is often impractical for building owners to relocate residents and businesses during this time. The annoyance to occupants caused by renovation work also means that property owners and contractors are under immense pressure to finish work as quickly as possible. Hopefully this accident will motivate Chinese authorities to enact a stricter safety standard on property owners doing renovation work on occupied buildings. Much like the 2008 Wenchuan Earthquake in Sichuan Province that uncovered the severe structural engineering defects in the many collapsed buildings, the Shanghai fire leaves the opportunity to improve safety measures to make sure that this type of tragedy never repeats itself.